At this moment, Company of Heroes 2 is my most eagerly-awaited game of 2013. Here's the first teaser trailer, which shows very little in the way of gameplay but does impress with its depiction of the Eastern Front of WW2 being considerably vaster than the western in scale, casualties and strategic importance. Creative Assembly have revealed that the next Total War title will be announced on 6 July at the Rezzed gaming convention. At the same time a number of PC gaming magazines have said that there will be a big reveal in their July issues. One of them, PC Gameplay, went as far as listing the contents for their next issue and confirming there will be an article on Total War: Rome II (or Rome II: Total War for those who preferred Creative Assembly's old-school naming system). Excellent news. Rome: Total War was an excellent strategy game (well, once the patches upgraded the AI to something more formidable) and the last title in the series to garner near-universal praise. 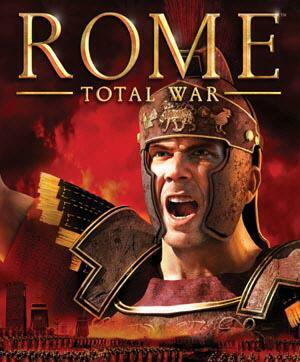 We can assume that Rome II will have vastly superior graphics and will likely employ the same format as the recent Empire, Napoleon and Shogun 2 (apparently it will continue to use the Warscape engine of those games) games by having both naval and ground battles, as well as possibly combined-arms operations. Expect more news in a couple of weeks' time when the formal announcement is made. 2033. Twenty years have passed since a nuclear apocalypse ended civilisation. A number of survivors have built an underground society based in the Moscow Metro. Stations and their adjoining halls and tunnels now serve as towns, some banded together into factions. Some of these factions are at war with one another, and all are threatened by the hostile creatures (transformed by radiation into mutants) that roam the tunnels and the overground. A young man named Artyom volunteers to leave his station and journey to the largest town in the metro, Polis, to seek help against the creatures threatening to destroy his home. However, this is only the start of a long journey as he discovers that there is a potentially greater threat gathering and he may be the only hope of stopping it. 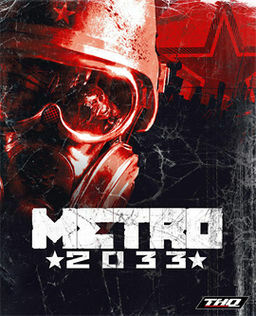 Metro 2033 is a first-person shooter developed by the Ukrainian 4A Studios, an off-shoot of the recently-closed GSC Game World (the creators of the STALKER series of games). It's a post-apocalyptic game employing some elements of survival horror in addition to its more traditional FPS trappings. The game is played from the POV of Artyom, who narrates the game through observations that appear during loading screens. Otherwise, he is a silent protagonist in-game, more willing to listen and learn from other characters than engage in lengthy conversations. The game style is inspired by the Half-Life series, most notably the idea that it's up to the player how much exposition and backstory they need to hear. When in a peaceful area, such as a town, you can simply press on immediately with the next mission or stick around and listen to conversations to pick up more information about the world and setting. There are a variety of NPC characters who help Artyom out during missions, though usually they are forced to bail out at some point, leaving Artyom to press on alone. The STALKER influence can be seen in the atmosphere, which is dark, brooding and often oppressive. When on the surface or in gas-filled chambers, Artyom has to wear a gas mask to survive. As the gas mask's filter clogs up, his breath starts to fog over the screen and the sound of his increasingly laboured breathing becomes dominant, until he replaces the filter. Finding filters is thus essential to survival (though only truly an onerous task at the highest difficult levels). This gives a tremendous sense of claustrophobia to some parts of the game. Another issue is that bullets are relatively difficult to find in the game and enemies tend to soak up a lot of damage, making the player have to think much more carefully whether to engage in combat or attempt to sneak past enemies by sticking to the shadows. The game employs a highly naturalistic style to its interface. Your journal and compass are in-game objects and looking at them means unequipping your weapon, which can be lethal in dangerous areas. The onscreen HUD only appears when needed and tends to vanish whenever you're not using it. There are both stealth and morality mechanics, the former tracking how locatable you are and the former how 'good' or 'bad' your decisions have been, but both are invisible to the player. This adds to the atmosphere, as it leaves you wondering if you have made the right decisions rather than being able to hit a button and bring up a bald numerical figure representing your situation. The game's art style is dark but impressive, cold in atmosphere and successful in conjuring up an air of constant terror during missions. The towns are warmer and richer, with people huddled over fires discussing how they are surviving and merchants eager to sell you their wares. However, the towns are let down by a lack of variety (they're similar to one another, with little in the way of optional side-quests available) and also a sense that they are not necessary. Whilst ammo is very limited, there's usually enough to be looted in the wild to make depleting your (extremely limited) supply of currency. Amusingly, currency in the game are also bullets, which in moments of desperation you can use as ammo. Combat is chunky and in many cases satisfying, but the game's difficulty level can make it frustrating. At normal difficulty headshots have no impact and enemies can take a lot of damage to kill. At high difficulty levels enemies can be killed more easily, but at the expense of also making you extremely fragile and also making ammo and money extremely difficult to find. Unfortunately, the game also pulls the old Far Cry trick of removing the satisfying human opponents in favour of unconvincing monsters and mutants later on, but unlike Far Cry never brings back the human enemies later on. The mutants tend to be much less satisfying to fight, which is a problem since they dominate the second half of the game. Particularly annoying are the ape-derived 'librarians', who take ludicrous amounts of ammo to put down. There is a system for 'staring them down', but it feels somewhat arbitrary whether employing this tactic is going to work or not. 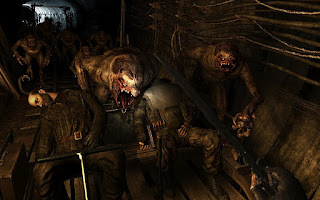 Metro 2033 features regenerating health, but only at a very slow rate, making it almost impossible to heal up mid-battle (you also have pain-killing injections that speeds up the process, but is little help in frantic firefights). There is also no cover system (at least beyond the old-school 'duck and pop up again to shoot' technique). These reductions in modern gaming's most tedious and over-used elements are successful in returning real menace and tension to combat, although they do sometimes go the other way and make battles annoyingly frustrating to win. This isn't helped by a checkpoint system that, whilst never as enragingly awful as Max Payne 3's, is still sometimes unforgiving, forcing you to replay lengthy sections as punishment for tiny mistakes (or random chance). The game's atmosphere is tremendously effective, its setting interesting (and surprisingly varied) and the characters you meet and ally with tend to be well-motivated individuals. There's a jet-black sense of humour that constantly pervades the game. The game also has a surprising, twist ending (but only if you've done enough 'good' acts to unlock it) that nicely subverts the violent action game you thought you were playing. This has to be balanced against sometimes frustrating spikes in difficulty and a sometimes ridiculous lack of ammo for a first-person shooter. Metro 2033 (****) is definitely one of the more original and impressive first-person shooters of recent years. If you can get over its brutally unforgiving difficulty, this is definitely a game worth playing. It is available now in the UK (PC, X-Box 360) and USA (PC, X-Box 360). Kenny Powers is a former baseball pitcher, noted for his powerful throws. He has been forced out of the game due to his drug-taking, partying, abrasive personality and use of steroids, all of which has also left him broke. Returning to his hometown of Shelby, North Carolina, he is forced to move in with his brother's family and take up a position as a temporary sports coach at his old high school. Powers is determined to both return to the major leagues and win back his old sweetheart, who is now engaged to the school principal, but finds it difficult to change his lifestyle and attitude. Eastbound and Down is a HBO comedy show starring Danny McBride, who also co-created the series. It's strongly similar in style to the Will Ferrell school of comedy (Ferrell is a producer on the show and has a recurring role), based on social faux pas and inappropriate behaviour with awkward silences and a healthy dose of swearing and occasional gross-out moments. However, freed from the cliches of the two-hour comedy movie format, the show is more successful at achieving a decent level of characterisation and (mostly) avoiding mawkish sentiment. McBride is the show's main star and makes the character of Powers work well. He's not a particularly sympathetic figure, especially as he himself is responsible for almost all of his problems, but is funny and possesses enough personality to make it plausible that he'd have so many friends and people who want to help him, despite his appalling behaviour. Most of the rest of the cast puts in good work, especially John Hawkes and Jennifer Irwin as Kenny's long-suffering brother and sister-in-law, but the show relies on McBride's performance in order to function and he does a good job with the more dramatic stuff (particularly the final episode, which Powers's ambitions and dreams are not so much crushed as painfully atomised) as well as the humour. The show employs an interesting device where each episode begins the moment the previous ends (breaking this format once), with the story continuously developing over the six-episode season. Character relationships evolve fairly steadily (and amusingly), although Powers's nemesis, Principal Cutler, doesn't work very well. It's good to see Will Ferrell being used fairly sparingly, but also disappointing that Craig Robinson's hilariously inept rival baseball player doesn't get more screentime. There are some problems with pacing. The show frontloads a lot of its best gags into the first episode and the rest suffer a little in the process, whilst a fair few characters are under-utilised. The short length of the season (six 30-minute episodes) also prevents a number of side-stories from being developed. This does result in a concise, focused series that is surprisingly restless, unwilling to settle into a predictable format and takes a major turn in direction at its conclusion. 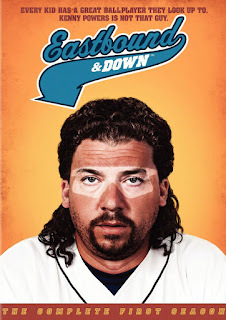 The first season of Eastbound and Down (***½) is watchable, funny and overall enjoyable thanks to some good performances, but is slightly let down by uneven pacing, a fair few jokes and moments that fall flat. 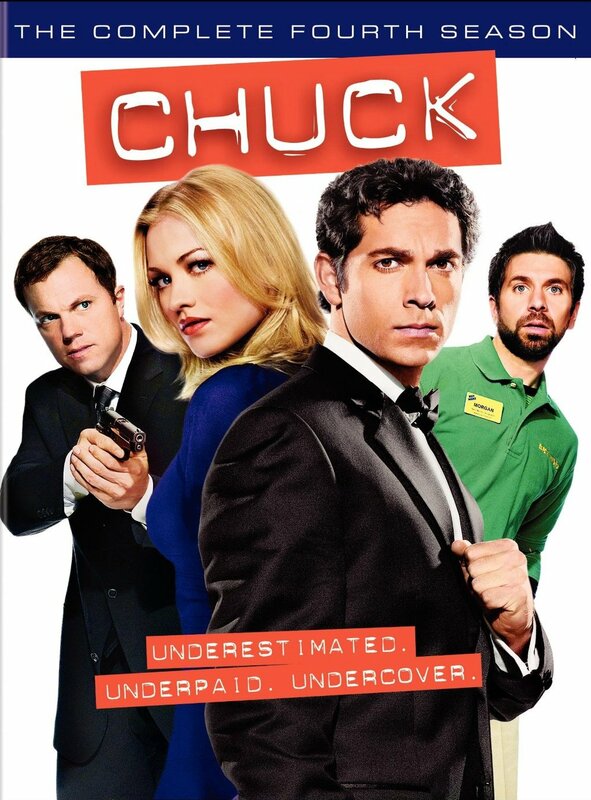 The show is available now in the UK (DVD, Blu-Ray) and USA (DVD, Blu-Ray). It is a time of tribulation for Kerin. Discriminated against in her village for the circumstances of her birth, her son Damaru is skytouched and will soon be blessed by being raised to the ranks of the Consorts. Events are complicated by the discovery of an unconscious man in the mere outside the village. As Kerin helps him regain his health, his memory comes back in fits and starts...and indicates that Kerin's world and everything she knows may be a lie. 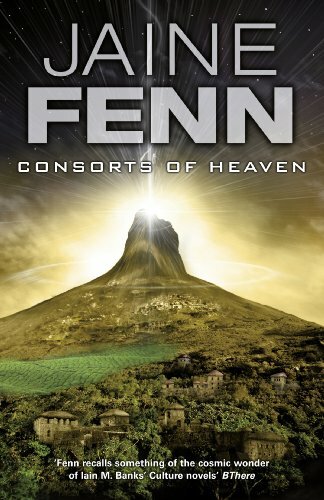 Consorts of Heaven is the second novel in Jaine Fenn's Hidden Empire sequence (which currently stands at four books, with a fifth out this year). It is not a follow-up to Principles of Angels, instead taking place roughly simultaneously with it but in a different part of the galaxy. It can be read independently of the first volume. The first novel was more overtly SF, with a dash of the New Weird added to it, but this second volume is more akin to traditional fantasy. It's set in a much more primitive world where some people have abilities that seem similar to magic. As with her first novel, Fenn has created an interesting world based on some solid foundations, and seeing how this lines up with what was established in Principles of Angels can be fun. Also, as with her first novel, Fenn undercuts the premise and fascinating backstory with a fairly indifferent prose style. This is made even worse by featuring some considerably less-interesting characters than the first book. The major protagonists - Kerin, the amnesiac Sais and the priest Einon - have potential, but ultimately end up being fairly straightforward and predictable. The commentary on the planet's problems, such as being in the grip of a religious theocracy and its issues with rampant sexism, also disappointingly never rise above the obvious. There are a few nice touches. A traditional SF mega-structure turns up later on in an interesting guise and, despite the primitive setting, we get a lot more information on how the basics of Fenn's SF universe work (such as how FTL is employed in the setting). But ultimately the novel, whilst certainly not disastrous, is not as engaging as its predecessor. Consorts of Heaven (***) is available now in the UK and USA. The first film, simply entitled Dungeons and Dragons, was an famously rubbish, medium-budget movie released in 2000, starring Jeremy Irons, Thora Birch and Marlon Wayans. The sequel, Wrath of the Dragon God, was released in 2005 and was a near-zero budget movie starring absolutely no-one you've ever heard of. Whilst the first film was awful, it did have some basic watchability (due to the excellent 'down a pint every time Jeremy Irons either overacts or looks like part of his soul has died due to the dialogue' drinking game). The sequel was fifty times worse. If the trailer is accurate, the third will continue this decline in quality to hitherto unsuspected depths. If you want to watch a decent D&D-based movie, I instead unreservedly recommend The Gamers II: Dorkness Rising, a very zero-budget indie movie made by fans with real talent and wit, and much more successfully nails what makes roleplaying games fun. Khesh City floats above the uninhabitable surface of the planet Vellern. It is a city of contrasts, with the rich and powerful living on the luxurious surface and the poor and downtrodden forced to live in the Undertow. The city is a democracy by assassination, where unpopular politicians can be removed by official killers known as Angels. When an Angel is brutally murdered, it falls to her nephew, Taro, to learn the reasons why. 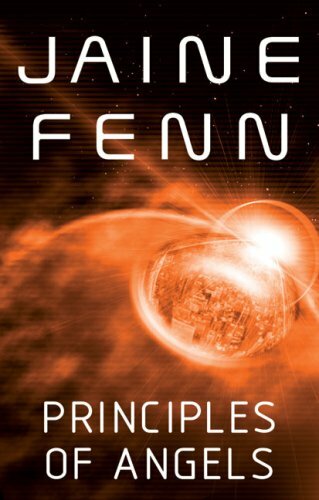 Principles of Angels, the debut novel by Jaine Fenn and the first in her loosely-linked Hidden Empire sequence, is a far-future SF novel centred on two contrasting protagonists: Taro, a male prostitute trying to avenge his murdered aunt, and Elarn, a high-class singer who has been blackmailed into travelling to the city to commit a heinous crime. Taro lives in an underworld of crime and exploitation, but is idealistic, which leads him into becoming an agent for the Minister, the city's enigmatic ruler. Elarn is a more civilised character, out to do the right thing but trapped in a situation not of her own making, one which could have severe repercussions for the entire human race. Other major characters include the Minister himself, the Angel Nual and detective/info-broker Meraint. Fenn does an effective job of distinguishing and motivating these individuals, although the focus is firmly on the two main characters (who alternate POV chapters for much of the novel). A thousand years before the events of the novel, mankind was ruled by an alien species, the Sidhe. Humanity broke free of their control and apparently destroyed them but, as the title of the series indicates, this may not be the case. Fenn does a good job of filling us in on this backstory by seeding the information into the text naturally, not relying on info-dumps. In doing so, she creates an intriguing universe which the reader definitely wants to see more of. The plot unfolds at a good pace, helped by the book's relatively concise length (the novel is just over 300 pages long in paperback) which keeps events moving nicely. The writing is reasonable, though given the weird and unusual nature of the setting possibly a little too straightforward. Ultimately, events unfold in interesting enough a manner to make the sequels - Consorts of Heaven, Guardians of Paradise, Bringer of Light and Queen of Nowhere - appealing. Principles of Angels (***½) is a decent debut novel, with well-drawn characters, a memorable setting and an interesting premise. The book suffers a little from too tight a focus on the two principals, which results in some of the more interesting side-cast being neglected, and also from a writing style that feels like it should have been bolder rather than settling for decent. It is still an entertaining book which effectively sets up a fascinating universe. The novel is available now in the UK and USA. "You afraid of your own shadow, Renly?" Sharp-eyed viewers will have spotted a few familiar faces shared by Ridley Scott's movie Prometheus and the HBO series Game of Thrones. This should not be a surprise as both projects shared a casting director, Nina Gold. Present and correct in both projects is actor Emun Elliott, who played the role of troubadour Marillion in Season 1 of Thrones. 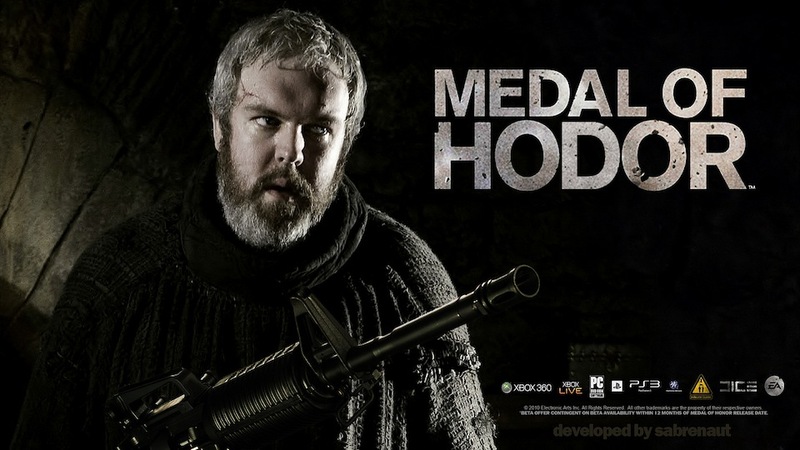 He was last seen in the Season 1 finale being punished by Joffrey for singing a rude song about his parents. 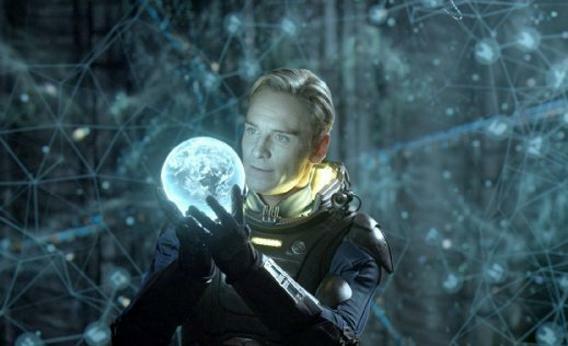 In Prometheus he plays the role of Chance, the starship's pilot. More immediately recognisable (Chance only having a major appearance very close to the end of the movie) should be Scottish actress Kate Dickie. Dickie appeared as Lady Lysa Arryn in the first season of Thrones, where for her first scene she memorably needed to sport a prosthetic breast for breast-feeding purposes. In Prometheus she plays the role of the ship's medic, Ford, whose medical decisions are frankly a bit head-scratching. Or indeed, head-exploding. Both actors had the honour of being killed (indirectly and directly, respectively) by Ian Whyte, who in Prometheus plays the Last Engineer (aka that big white guy they really shouldn't have woken up). 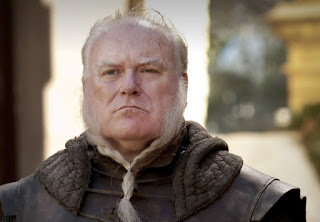 In Thrones Whyte has two different roles. 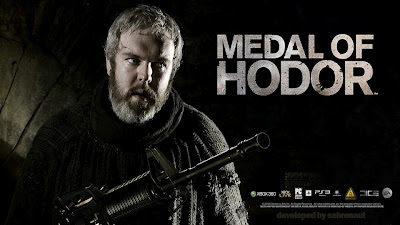 In the pilot and one episode of Season 2 he played a White Walker but, presumably after complaining of being typecast as really tall, pale dudes who kill humans for no discernible reason, he then pulled double duty as Gregor Clegane Mk. II, replacing Conan Stevens. As well as actors, both projects filmed in Iceland. Prometheus filmed in the area around the Hekla volcano for the 'birth of life' prologue sequence, whilst exterior plates for LV-233 were also filmed in the area. The Dettifoss waterfell in the north-east of Iceland was also used as a filming location. All-told, Prometheus filmed in Iceland for two weeks in July 2011. Thrones filmed on the huge Vatnajökull glacier for the sequences set beyond the Wall, most notably at the Fist of the First Men and for Jon Snow's meeting with Ygritte. HBO filmed there for four weeks in October-November 2011. 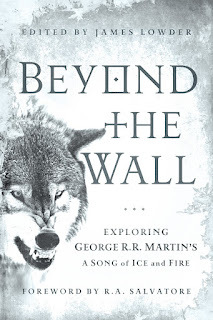 Beyond the Wall, the Song of Ice and Fire essay anthology I have contributed to, is now on sale in some bookshops (though the official release date is not until next week, I believe). Forbidden Planet in London had several copies on sale yesterday, so I imagine that other copies will be out there in the wild. An alien protomolocule has taken root on Venus. Earth and Mars are in a shooting match over an incident on Ganymede. The Solar system is moving towards all-out anarchy and war, and it falls to a well-meaning meddler, a canny politician, a Martian marine and a grief-stricken botanist to try to stop the descent into madness. Caliban's War is the second novel in The Expanse series, following on from last year's well-received Leviathan Wakes. This is old-school space opera, featuring the crew of a spacecraft as they attempt to save the Solar system from an alien menace. The series features some nods towards serious science - the ships work strictly by Newtonian physics and there is no FTL travel, with the scope of events being limited (so far) to the Solar system alone - but it's certainly not hard SF. The emphasis is being on an entertaining, fast-paced read, and the book pulls this off with aplomb. The cast of characters has been expanded in this volume, with only Holden returning as a POV character from the first volume. Unlike the first novel, which had a grand total of two POVs, this second volume features four: Holden, UN politician Avasarala, botanist Prax and marine Bonnie. This means that the authors have three major new characters to introduce us to, as well as continuing the storyline from the first novel and evolving the returning cast of characters (Holden and his crew). This results in the pace being marginally slower than in Leviathan Wakes, although certainly not fatally so. Indeed, Abraham and Franck imbue the new characters with interesting backstories, motivations and quirks. It's also quite amusing that the most enjoyable character in an action-packed space opera is a 70-year-old politician with a potty mouth. There's some major shoot-outs, a few big space battles, a close encounter with a rampaging monster in a zero-gravity cargo hold and other action set pieces that are handled well, but the book falters a little in its handling of politics (which are fairly lightweight) and the characterisation of the bad guys, who never rise above the obvious. 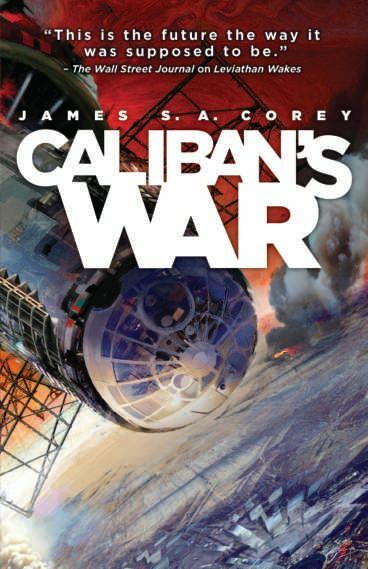 Caliban's War (***½) is not as accomplished as its forebear but is still a page-turning, solidly enjoyable read. The novel is available now in the UK and USA. Several years have passed since Max Payne's last adventure. He has left the NYPD and now spends his nights drinking in seedy bars. He is recruited by a former colleague to work security for the rich Branco family in São Paulo, Brazil, in what appears to be an easy job. When Max's charge, his employer's wife, is kidnapped by a gang, he finds himself drawn into a conspiracy which will lead him into some very dark places as he tries to redeem himself and find out what's going on in this city. Max Payne 3 sees the return of the titular hero after a break of nine years. Remedy Entertainment, who made the first two games in the series, have moved on with their Alan Wake series of games, leaving Rockstar (best-known for the Grand Theft Auto series) to carry on their work. Whilst fans of the earlier games were dubious of this move, it was actually reasonably logical. Rockstar games often feature damaged protagonists trying to live better lives but being drawn back into a life of violence by circumstances, which is a perfect fit for Payne. The game acts as a reboot of the series. References to the events of the first two games are minimal and, aside from a couple of flashback missions set in New York, the game is set in a different city in a different country with a very different culture (not to mention a different and un-translated language). The only constants are Max himself and, of course, his ability to slow down time to engage in combat. Max Payne 3 is overwhelmingly impressive from a production values standpoint. The graphics are fantastic, with the game employing a vivid visual style. Keywords from conversations flash onto the screen and sometimes the action dissolves into line breaks and the colour desaturates, almost like you're watching the action on an old 1980s TV that is about to expire. The game's colour palette tends towards the bright and colourful, but there is a dark hue to everything. Sections set in crumbling warehouses or an abandoned hotel contrast the light and dark elements of the game's style. Animation is astonishing, with Max storing his weapons on his person and moving them around naturally to swap guns or take painkillers. The game feels like it's had a million dollars spent on every single minute of it (in sharp contrast to the low-budget feel of the first game, with its amateur cut scene actors). The game's centerpiece is action and gunfights, and the title impresses in these areas. Combat is hard, fast and furious, with effective use of bullet time necessary to proceed. The game also employs a cover system, one of the more tiresome elements of modern action gaming, but the use of bullet time and headshots makes it mostly an optional feature with only a few moments where its use is necessary to proceed. More satisfyingly, the ludicrous modern gaming concept of 'regenerating health' has been thrown out of the window and replaced by Max's more familiar use of painkillers, adding a great deal of tension to the action sequences and requiring the player to plan attacks more intelligently than just charging in, knowing you can hide behind a box to get your health back. Unfortunately, bullet time has been gimped since the second game. There's only one level of bullet time (you don't get additional slowdowns when you shoot more people) and, ridiculously, it doesn't regenerate when you make kills. Given it is fairly slow to regenerate, a fair amount of combat has to take place without the use of the game's central mechanic and main selling-point, which seems strange. The writing is okay, though Dan Houser's script is notably less funny, knowing or introspective than Sam Lake's work on the first two games. But it's reasonable and House deserves some props for moving Max on in his life, continuing his character arc and trajectory from the first two games. The other characters in the game are somewhat less successful, with no memorable equivalent to say Vladimir Lem or Mona Sax, but they do their job well enough. 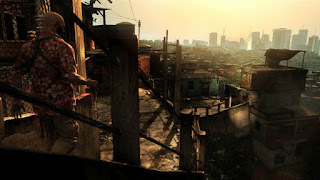 The change of setting is far more successful, with São Paulo (or, rather, the criminal underworld that is the main setting) presented as a dark, threatening city which is a perfect match for the semi-noir stylings of the series. This is backed up by the soundtrack (by American band Health), which is excellent. So the game is well-made, with amazing production values, a decent story, some good characterisation and great action (if not quite as well-executed as the first two games). But there is a major problem. You see, the game doesn't actually like you playing it very much. For every minute you spend actually playing the game, it demands that you spend at least another watching it play itself, through intrusive use of lengthy, unskippable (as they hide loading sequences) and non-interactive cut scenes. Cut scenes are not just present at the start and end of each level with maybe a few reserved for major moments mid-level (the sort of structure the first two games employed), but they take place near-continuously. Frequently. opening a door will trigger a cut scene showing Max going through the door and taking cover before letting you resume control. This even happens if you've already flown through the door in shootdodge mode, resulting in frustrating (and continuity-breaking) moments where you could have wiped out a dozen bad guys in five seconds in bullet time but the game demands that you hide behind a counter instead and fire from cover. Cut scenes often kick in after you've dispatched the last bad guy in an area, taking you to a new area with no opportunity to loot the enemies for ammo (which is in fairly short supply throughout most of the game). There are also too many moments when the game has Max doing some really cool things (like diving between moving trains or jumping from an exploding rooftop onto a helicopter) when you don't have control. Max Payne 3 is, of course, a linear action game and railroading is to be expected. Certainly the first two games had a lot of cut scenes and moments where player choice was taken away, but generally it was in areas where it made sense. They were also infrequent compared to the amount of time the player had control. Max Payne 3 actually seems to resent you doing anything other than what it wants you to, and punishes you if you try. 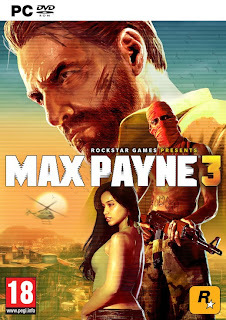 During a shoot-out near a plane taking off, any attempt to jump onto the plane will result in a cut scene where a bad guy kills Max with a grenade, with Max standing there and unable to do anything. During a battle on a river dock, falling in the water will result in Max's instantaneous death, despite him being able to swim in a cut scene a minute later. Despite Max's ability to slow down time in gameplay, in a cut scene he runs into a room where a friend is being held hostage and is powerless to stop them being executed, despite the fact that if you had control you could wipe out everyone there in moments. The game also employs a checkpoint system rather than allowing quicksaves, resulting in the player sometimes having to repeat 10-15-minute long sequences if they are killed, which is simply unacceptable. When it actually lets you play it, Max Payne 3 (***) features some intense and engrossing action sequences. However, the game makes the classic mistake of placing itself and its story (which is decent but nothing special) ahead of the enjoyment of the player. As a visual experience, Max Payne 3 is impressive and intermittently even brilliant, but as a game it's a let-down compared to the first two titles in the series. It is available now in the UK (PC, X-Box 360, PlayStation 3) and in the USA (PC, X-Box 360, PlayStation 3). 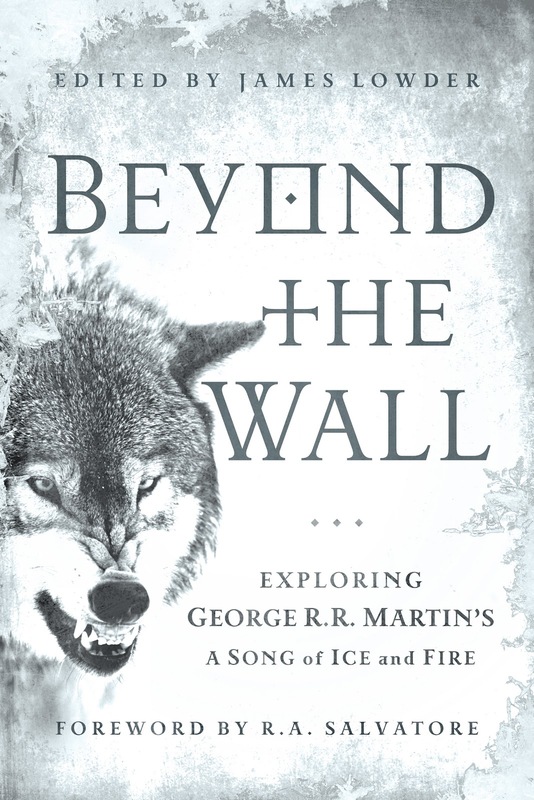 Three castmembers from Game of Thrones have been recruited to record audiobook versions of George R.R. Martin's earlier work. Iain Glen, who plays Ser Jorah Mormont, will be recording Dying of the Light, Martin's debut novel. Published in 1977, the book chronicles the reunion between a man and his first love on a rogue planet disappearing into the endless night of space. 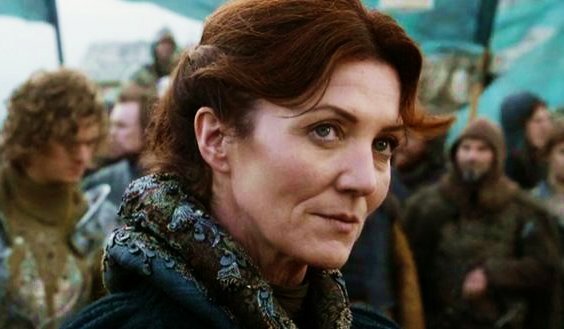 Michelle Fairley, who plays Catelyn Stark on the TV series, will be recording Windhaven. This novel was a collaboration between Martin and Lisa Tuttle, originally published in 1981. It is set on a planet of numerous, small islands where strong winds allow 'flyers' - people wearing wings of superstrong, light material from their ancestors' crashed spaceship - to move between islands quickly. Finally, and most appropriately, Ron Donachie, Ser Rodrick Cassel on the show, will be recording Fevre Dream, Martin's classic 1982 vampire novel. 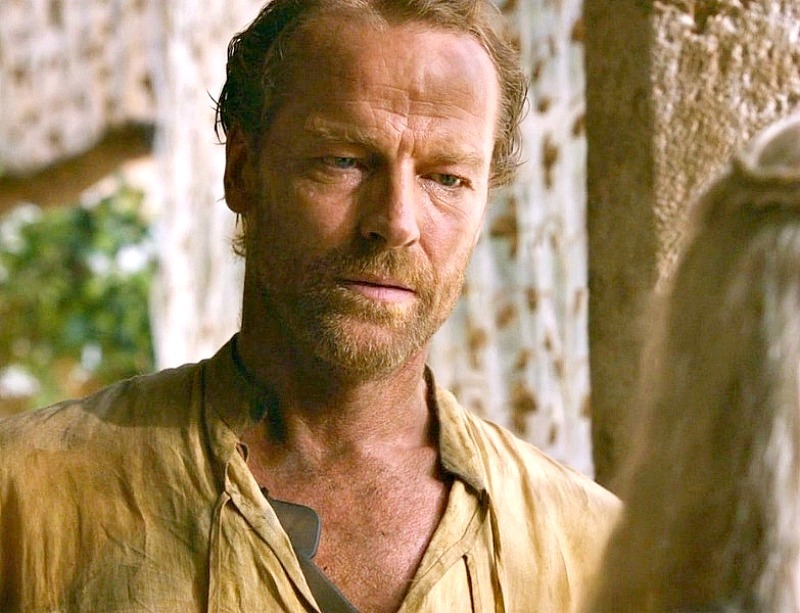 Donachie himself read the novel some years before being cast on Game of Thrones and was a huge fan. He has been suggested for the role of Captain Abner Marsh, the novel's main character, should it ever be made into a film. In the same blog entry, Martin also reveals that The Armageddon Rag will almost certainly never be an audiobook, due to the difficulties of clearing the music used in the novel. 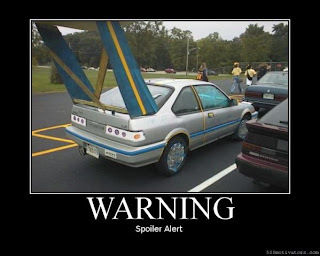 NOTE: MASSIVE SPOILERS FOR PROMETHEUS, ALIEN AND ALIENS. An Engineer ship crash-landing on the surface of LV-223 in 2093. 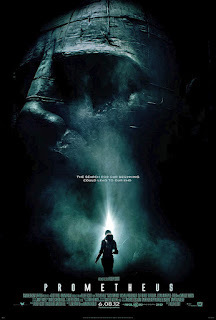 Prometheus opens in 2089 with the discovery of a cave painting in Scotland which points the way to the Engineer base. The ship arrives at this location in the final week of 2093, with the final moments of the film taking place on New Year's Day, 2094. No date is given in Alien for the action, save that it happens in the 22nd Century (due to the presence of a crew uniform patch that says, 'Flag of the United Americas 2104 to present'). In Aliens Carter Burke orders the colonists to investigate the crashed Engineer ship on 12 June '79. Assuming Aliens happens in 2179, then Alien takes place 57 years earlier, in 2122 (and this was later confirmed in featurettes in the Alien Legacy boxed set). From a computer display at the start of Alien, the movie starts on 3 June. Thus, Prometheus concludes 28 years, 5 months and 2 days before the start of Alien. The planet LV-426 orbits, along with several of its moons, in 2122. The planetary body that Prometheus flies to is called LV-223. The planetoid that the Nostromo crew land on in Alien (and is later colonised by the Weyland-Yutani Corporation prior to the events of Aliens) is called LV-426, informally known as 'Acheron'. The different designations seemingly confirm that these are different planetoids. Both planetoids are depicted as moons circling larger gas giants. LV-426 is one of at least four moons orbiting a red-hued gas giant. LV-223 is one of two moons orbiting a blue-coloured gas giant. Given that we physically see four moons in Alien (three moons and the gas giant are seen in LV-426's sky) and a comprehensive 3D starmap in Prometheus only shows two, the conclusion is that these are different gas giants (otherwise the gas giant changes colour and acquires two additional moons in thirty years, which seems implausible). 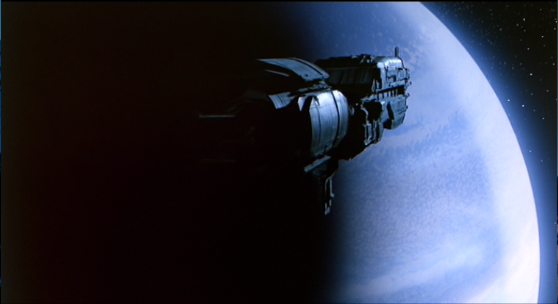 In Alien, LV-426 is identified as being located in the Zeta II Reticuli star system. Zeta Reticuli is a real star system located 39.16 light-years from Earth in the constellation Reticulum, consisting of two stars in a binary orbit. However, the two stars are extremely far apart (dozens of times the distance between the Sun and Pluto), meaning that each star could hold an extensive solar system of its own without gravitationally interfering with the other. LV-223, along with its mother planet and another moon, as shown on the Prometheus's scanners in 2093. 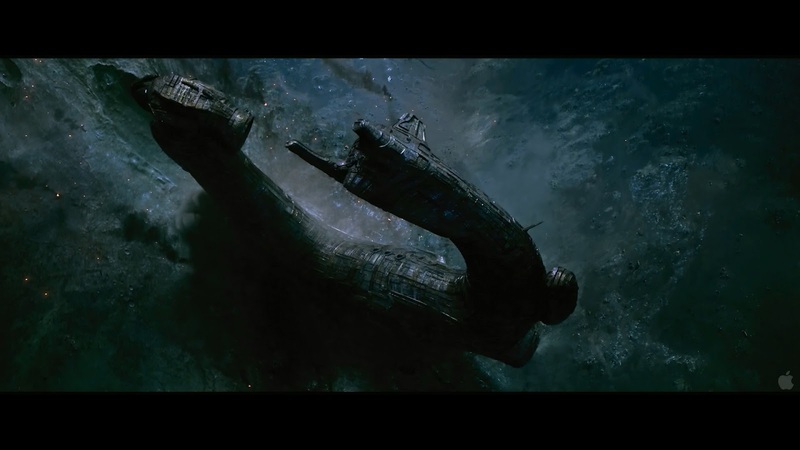 In Prometheus, the destination star system is not identified. A distance of 327,000,000,000,000 km is given, which translates as 34.56 light-years. Given that Zeta Reticuli's distance has been estimated with a strong degree of accuracy (the error margin is only 0.1 light-years), this would seem to confirm that LV-422 is not only a different planetoid to the one in Alien and Aliens, but is located in a totally different star system altogether. Some fans have postulated that LV-422 is located at Gliese 86, a star just under 35 light-years away in the constellation of Eridanus. This is especially popular as an extrasolar gas giant was discovered circling Gliese 86 in 2000. Gliese 86 and Zeta Reticuli are located in the same general neighbourhood, only being separated from one another by 10 light-years. This splendid theorising has been torpedoed by Ridley Scott saying straight-out that Prometheus takes place in the Zeta Reticuli II star system as well, however. Thus, the two planetoids in Prometheus and Alien - LV-223 and LV-426 - are different planetoids but they are located in the same star system. Based on the evidence above, I'd still suggest they are orbiting different gas giants. The USS Sulaco approaching LV-426 in 2179. According to Prometheus, the Engineers built an extensive military installation on LV-223 more than two thousand years ago. This installation consists of approximately five large domed buildings, each huge in size. At least two of the buildings had large, horseshoe-shaped spacecraft located adjacent to them. The installation appeared to be a base for the creation of a biological weapon of mass destruction, apparently for use against Earth. This facility was overrun and its population almost completely wiped out by unknown forces (but likely a bioweapon they lost control of) approximately 2,000 years before the events of Alien. In Alien and Aliens, an Engineer starship of similar design to those seen in Prometheus is found on the surface of LV-426. Initial assumptions were that it had crashed, but more recent interviews (at the 18-minute mark) have suggested it landed or was parked deliberately there. According to Ridley Scott, this ship originated at the LV-223 facility and was on its way somewhere else (presumably not Earth) with its cargo of facehuggers when its cargo got out of control. The pilot landed on LV-426 and was killed, within a couple of hundred years of the destruction of the LV-223 facility (so between 1,800 and 2,200 years before the events of Alien). The fact that the facehugger eggs could survive and remain viable for that time period is impressive. A mural in the Engineer base on LV-223, suggesting that the xenomorphs were extant more than 2,000 years ago. On LV-223 a black liquid stored in vase-like containers serves as a destructive bioweapon. It can animate corpses, turning them into monstrous killers, and transform little worms into large, snake-like monsters. Rather more bizarrely, it can convert human sperm into a parasite-like creature that, when given a female human body to gestate in, transforms into a squid-like creature which can grow to colossal (some might indeed say, totally fricking preposterous) size and then impregnate another type of creature into another host, a creature which more closely resembles the traditional xenomorphs. On LV-426, the cargo of the crashed Engineer ship consisted of eggs which, when hatched, produced parasitic 'facehuggers'. These creatures would attach themselves to a human or animal host and place an embryo in their chest. After a period of gestation (typically several hours, or several days for a queen creature capable of laying further eggs en masse) this 'chestburster' erupts through the host's ribcage and grows to large size within a matter of hours. This creature is the traditional xenomorph. Unlike the black goo things on LV-223, the xenomorph's life cycle appears fairly stable and predictable. 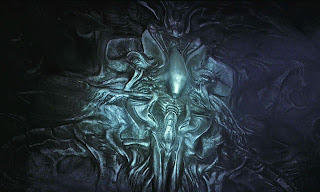 Note that, based on both the information provided by Scott in interviews and the mural in the LV-223 facility depicting the traditional xenomorph, the traditional xeno appears to have already been in existence for some time when the base on LV-223 was wiped out. This would then seem to contradict the popular (and perhaps obvious) theory that the black goo stuff in Prometheus is some type of prototype that would lead to the familiar xeno in future films (though the appearance of a proto-xeno in the final seconds of Prometheus would seem to suggest that this was the direction things were heading in). Based on all of this I would argue that the standard xenomorph was already in existence and the Prometheus bioweapon was an attempt to replicate it. Given the inefficency of the Prometheus creatures, with a confusing and bizarre life-cycle, it can be concluded that the Prometheus bioweapon was a miserable failure. 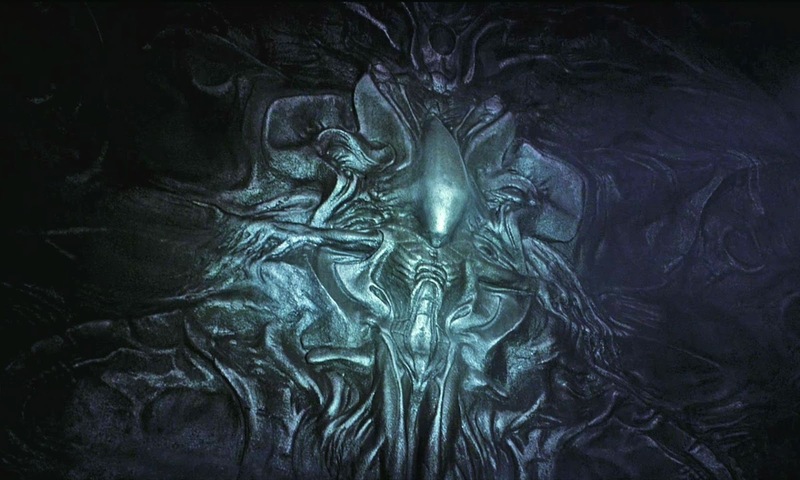 Perhaps all of their 'normal' xenomorph eggs had been put on the LV-426 ship and they were forced to develop a secondary weapon when their main one was put beyond their reach (which seems extremely unlikely, but there doesn't seem to be too many other conclusions that can be reached)? The Engineers are an intelligent alien race who may have had a hand in the appearance of life on Earth. If not, they certainly visited our stone age ancestors around 35,000 years ago. 2,000 years ago a group of Engineers, possibly military in origin, established a base on LV-223, a moon in the Zeta II Reticuli system, 39 light-years from Earth. They created a bioweapon, apparently taking inspiration from an already-existing alien lifeform known as the xenomorph. They apparently decided to wipe out life on Earth for reasons unknown (possibly ranging from fear that their creations were getting out of control to one of their emissaries being nailed to a cross - this latter idea is extremely idiotic, so hopefully that's not the direction they are going in). A ship took of from the LV-223 base carrying a cargo hold full of xenomorph eggs. The pilot ended up getting infected. He made an emergency landing on LV-426, a moon circling a neighbouring gas giant in the same system, but was killed. He activated a warning beacon telling his fellows to stay away. They respected that and did not go after him. Instead, they decided to use their own bioweapon (perhaps thinking they could control it better than the xenos themselves, or perhaps they had put all of their xeno eggs on the ship and lost them in the crash) against Earth, but it got out of control and wiped out most of the facility. The last surviving Engineer managed to seal himself in stasis in a ship away from the threat of the bioweapon but ended up oversleeping by 2,000 years, until he was awoken by the crew of the Prometheus and was then infected by the bioweapon and killed. There are still plot holes you can drive a power loader through in this scenario, but this does seem to be a fairly likely chain of events given the information we have so far. SF author Neal Stephenson - of Snow Crash, Cryptonomicon, Baroque Cycle, Anathem and Reamde fame - is apparently unhappy with the depiction of swordfighting in computer games, so is now working on a new system. He's set up a Kickstarter (crowd-funding) project and asked for half a million dollars, roping in a whole bunch of experts and some nifty swords-with-sensors-attached to help pitch the idea. Interesting. Mental, clearly, but interesting if they can actually pull it off. Stephenson's pitch is quite amusing and apparently they raised $30,000 within a few hours of the page going up, so I wouldn't be surprised to see the project succeed in raising the initial investment. 2089. During an archaeological dig on the Isle of Skye, scientists Elizabeth Shaw and Charlie Holloway discover cave paintings from tens of thousands of years ago, prominently showing a star pattern in the sky. This same pattern can be found in cave paintings, stone carvings and other artifacts from ancient civilisations that never had any connection with one another. Shaw and Holloway, who believe that humanity was created by another species, convince Peter Weyland, one of the richest people in the world, to fund an expedition to the star system indicated by the pattern. Christmas, 2093. The interstellar exploration vessel Prometheus arrives at LV-223, a moon circling a giant ringed planet. The crew discover a series of vast, artificial structures and begin an exploration, hoping to find evidence of humanity's creators. Initial findings suggest that the inhabitants of the planet are long dead...until the deaths begin. 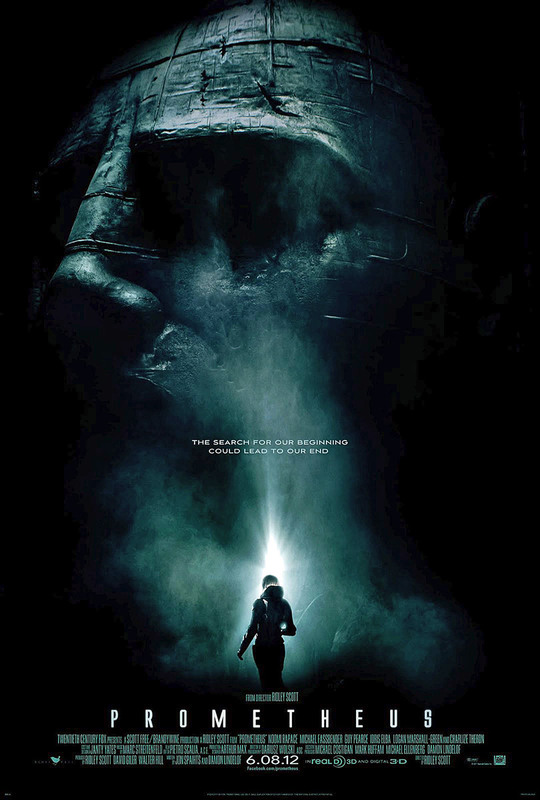 Prometheus is a quasi-prequel to Ridley Scott's 1979 classic, Alien. It's set in the same universe and concerns itself with one element from the other films, most notably the origin and identity of the dead 'space jockey' creature found in the first movie. However, contrary to expectations, it's not a direct prequel. There's still a fairly substantial gap (of almost thirty years and several star systems) between the way things are left at the end of Prometheus and where they are at the start of Alien, to be filled in by sequels (if Prometheus is a financial success) or by the viewer's imagination (if it isn't). The distancing of Prometheus from the rest of the franchise allows it to be fully enjoyed without any foreknowledge of Alien, which is a good thing. Prometheus is Ridley Scott's first foray into SF since 1982's Blade Runner and is also, easily, his best movie since Gladiator. Visually, the film is stunning, rich in detail and thoroughly impressive. Scott's directorial powers have not been diminished by age, with some brilliance evocations of landscape and atmosphere. Nor have his abilities with terror dimmed: there are some moments in the film which are genuinely stomach-clenching, including at least one moment which made the audience I was with react with audible horror (and caused several to walk out). It's also rare in being a movie where the 3D element is successfully integrated with the rest of the picture rather than being an ill-considered afterthought. The effects are, of course, awesome as well, all the more effective for so much being achieved practically rather than CGI. The use of actual, massive sets rather than CGI backdrops also immensely enriches the visual style of the film. In terms of performances, clearly this was always going to work well: Noomi Rapace, Michael Fassbender, Guy Pearce, Idris Elba and Charlize Theron are all on top form, delivering convincing and impressive performances. Especially noteworthy are Rapace, our convincing main character, and Fassbender, whose portrayal of an android with ambiguous motivations provides much food for thought. In terms of pacing, the first half or so of the film works well. We're rushed through early scene-setting scenes and get to LV-223 almost ridiculously fast, with lots of backstory being filled in through a mission briefing sequence. This works well and gets us to the action quickly. Lots of odd elements are established early on (what is David doing in that secret chamber on the ship?) and developed in an interesting manner, with some intelligent foreshadowing of a later plot twist. Initial explorations of the alien planet are hampered by an awesome sequence in which the characters are caught up in a silica dust storm, which may be the film's most impressive visual moment (a later 3D holomap sequence is also up there in quality). Then, of course, the movie starts to falter. The film's biggest problem is that it is forced to resort to 'movie logic' to keep the story on track. Having the alien planet reconnoitred by probes before Prometheus lands, or having the robotic sphere-things zipping around inside whilst the humans watch from a distance, would be far more logical and convincing than everyone just bundling inside the structure and running around like headless chickens, getting separated, disappearing, killed etc. For a bunch of scientists these guys are pretty inept. Shaw and Holloway's theories about humans being the result of alien genetic engineering are never backed up by evidence (when asked about how her theory is disproved by evolution, Shaw's answer is a moronic, "I choose to believe,") and no-one in the movie has ever heard of quarantine or slow, methodical investigations. There's too much reliance on short decontamination sequences which, predictably, end up not working, allowing mayhem to erupt. Major characters are also apparently capable of running around and engaging in severe physical exertion minutes after undergoing major and traumatic surgery of the sort that most people would take months to recover from. The less said about the final 'confrontation' in the alien vessel's control centre (in which quite a few of our characters appear to have had full lobotomies) the better, and the musical score is also severely annoying. In some moments, it's okay, but in too many others the overwhelming bombast of the music is tonally inappropriate (I had to double-check to make sure it wasn't the guy who does Doctor Who's music). There is much to enjoy about Prometheus. It's the best film in the Aliens universe to be released for more than twenty-five years, which is in itself an impressive achievement. It's visually stunning. The performances are excellent. The humanoid alien species (aka 'space jockeys' in the franchise's parlance) are an interesting creation and you definitely end up wanting to know more about them. There's a great deal of backstory that's left undeveloped and it'll definitely be interesting to find out more about why these 'engineers' created humanity and then decided it was a mistake. It's also great to see an adult-oriented, adult-rated film with a big budget which genuinely unsettles and scares the audience. The ingredients are certainly present for something that could have been brilliant. Instead, the film is sold short by lazy contrivance, dubious movie logic and some poor plotting. Little in the final quarter or so of the film makes sense, the result of it trying to do too much with too many characters in too short a running time (Idris Elba gets sold rather short, despite some excellent lines and moments). Ultimately, Prometheus (***½) is an overwhelmingly impressive visual spectacle and an effective horror experience, definitely worthy of being seen on the big screen, which is undercut by some severe logic and scripting problems which disrupt the viewer's sense of disbelief. The movie is on general release right now. Matthew Swift is an urban sorcerer, someone who can channel the energies of the city to perform great deeds of magic. He is also dead, torn of pieces by a shadowy monster. He is therefore confused to be up and walking around again, with two years passing in the blink of an eye. As Swift struggles to find out what has happened to him, he learns many of his friends are dead, his greatest ally may now be a dangerous enemy and that his only hope of survival may lie with a band of ill-matched wizards, bikers and fortune tellers who hate one another almost as much as their mutual foe. Urban fantasy is a crowded subgenre and stand out from the tosh is an increasingly hard trick to pull off. Fortunately, A Madness of Angels manages to do so through sheer skill and accomplishment. 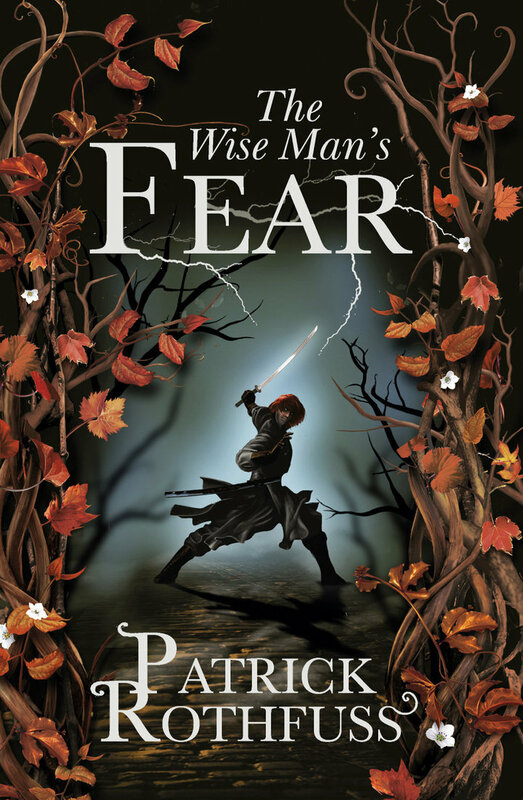 Unlike many series in the genre, which require multiple volumes to gain traction and confidence, this series gets off to a flying start with a book which is brimming with confidence. Kate Griffin is a pseudonym for Catherine Webb, who had already published numerous YA novels (the first at the age of 16) before tackling this, her first adult work. That experience shows with a bold introduction to the world and characters that most authors would probably steer clear of. The novel opens in media res as Swift is dropped (almost kicking and screaming) back into the life he was snatched away from two years earlier. Strangers are living in what used to be his house and strange forces are chasing him down London streets and trying to murder him. Swift's uses of personal pronouns (he moves between 'I' and 'we' almost randomly) is confused. Bizarrity abounds. We're almost fifty pages in before things start calming down and can start putting the pieces of the puzzle together. It may be harder work than having information dumped in an obvious fashion, but it's also more rewarding (and unlike say Steven Erikson, we at least get the answers to the mysteries in the same novel). Griffin's prose is a cut above the average for this subgenre, fairly sparkling as it moves between describing feats of magic and the city itself. London is the setting for many urban fantasy novels, but not even in Neil Gaiman's Neverwhere is it evoked as strongly as in this book. The rhythms and beats of the city are given vivid life, not just to merely establish background but also in the magic of the book. In Griffin's world, magic is an evolving, constantly changing force. It's moved into the city and taken its nature as its own, with bag ladies, bike-riding couriers and crazy back-street magic shops having unusual powers and trains and electricity developing their own types of magic. Swift is our first-person POV character and, normally, the format would restrict any sense of mystery in the character. However, the circumstances of Swift's demise and resurrection are extremely confused, even to Swift himself, and this allows a fair amount of time to pass before we get the full picture of Swift's background and character. 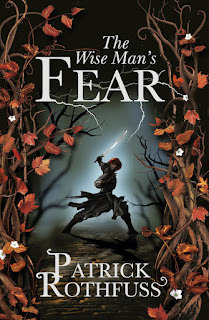 He is a well-drawn protagonist, more capable and powerful than many an urban fantasy lead character, but not overpowered or invulnerable (as a running joke about how he can't go more than a few hours between visits to cleaning shops to get blood and/or scorch marks out of his clothes indicates). He's also undergone a fairly radical transformation of the soul as a result of his experiences, and Griffin explores this in interesting psychological detail. The 'old' Swift appears to be more humourous and sarcastic than the 'current' one, who bursts of black humour aside is more passive. The reasons for this are intriguing. The supporting cast is impressively-depicted as well, with the 'villains' having their own motivations and desires rather than being evil for the sake of it. 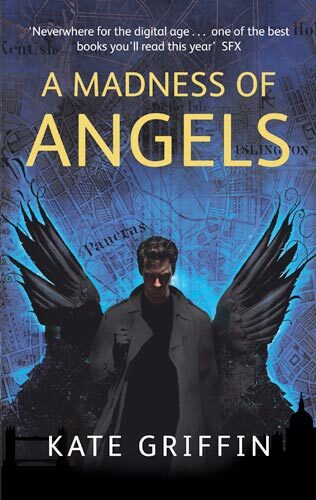 A Madness of Angels is highly impressive, especially for the opening novel of a series (though the books are somewhat episodic; this first volume doesn't have a cliffhanger ending or anything of the sort) and only has a few minor issues. The first fifty pages or so sees some clearing of the throat going on as Griffin attempts to find her voice. A laudable attempt to inject a slightly more offbeat writing style into the book ends up with a few instances of purple prose before she finds a more comfortable writing style. There's also probably a bit too much information given away early in the book about the central mysteries, allowing readers to deduce what's going on a little while before the characters. 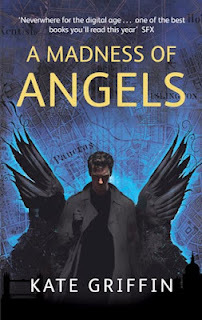 Aside from these niggles, A Madness of Angels (****½) is an accomplished, highly readable novel and promises great things for later books in the series. The novel is available now in the UK and USA. For Part 1 of this recap, see here. For Part 2, see here. 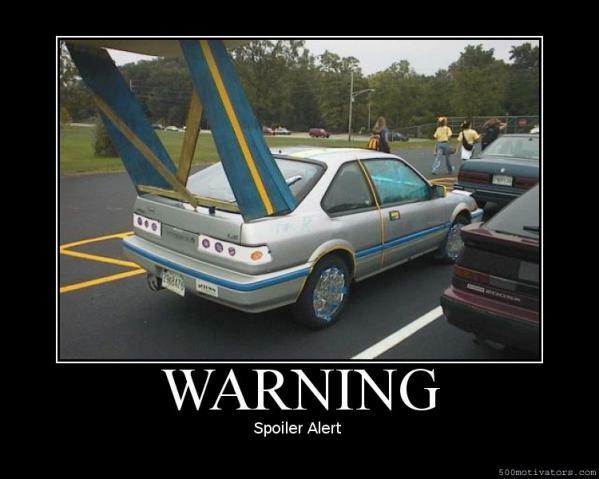 As usual, spoilers for those who are unfamiliar with the series. The nations following the Trolloc Wars and before the rise of Artur Hawkwing. Humanity had proved victorious in the Trolloc Wars, destroying the armies of Shadowspawn and driving their shattered remnants back into the Great Blight. However, the chaos and devastation of the conflict proved too much for what was left of the Ten Nations. Half had fallen during the war and the other half followed soon after. In their wake, twenty-nine new nations arose. Despite the best efforts of the Aes Sedai to keep the peace, the new nations were fractious, more prone to waging war with one another over minor border disputes. No second Compact arose to replace that of the preceding millennium, with each nation choosing instead to maintain a substantial standing army to answer any future Trolloc threat. The chaos of the Trolloc Wars was such that humanity had even lost track of what year it was, so in the aftermath of the conflict a new calendar was created by Tiam of Gazar, counting the number of Free Years since the war had ended. 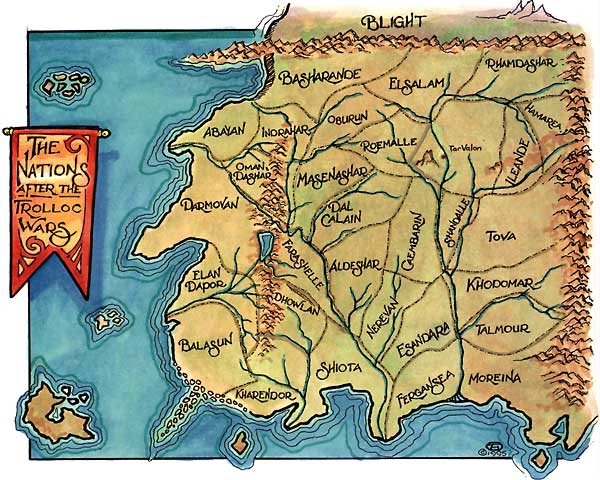 This was a new era of small wars and conflicts, not helped by the Aes Sedai's numbers beginning a serious decline that inhibited them from as easily mediating conflicts and disputes as before. Still, Aes Sedai influence remained strong. In FY 450 the Aes Sedai forcibly apprehended Queen Sulmara of Masenashar and forced her to clean out the stables of the White Tower for the rest of her life. Her crime is not recorded, but the fact that the Aes Sedai could act so without reprisal is startling. The Aes Sedai's power was also strengthened in FY 351 when they apprehended and gentled the false Dragon Davian. Davian's activities, along with the occasional Shadowspawn raid into the northern-most kingdoms of Basharande, Elsalam and Rhamdashar, reminded the world that the Prophecies of the Dragon remained in force, and the threat of the Shadow was still a real one. In FY 939, in the aftermath of a devastating plague known as the Black Fever, a charismatic nobleman from the nation of Darmovan declared himself the Dragon Reborn. Guaire Amalasan was a skilled diplomat, a canny tactician and possessed the common touch, winning the love of the people for his charitable acts during the worst of the plague. Tens of thousands flocked to his banner and he conquered much of the southern half of the continent in a war lasting four years, the War of the Second Dragon. The Aes Sedai, distracted by the plague, were slow to reach and when they did send half a dozen sisters to apprehend Amalasan, he was able to defeat them handily. Amalasan, as with every false Dragon before him, knew that taking the Stone of Tear was vital to prove his claim. His armies laid siege to the Stone (then located in the nation of Moreina), but were unable to take it due to it being defended by almost forty Aes Sedai. Amalasan left a force behind to maintain the siege before marching north, intent on completing the conquest of the continent. However, in the foothills of the Maraside Mountains (on the modern southern border of Cairhien, then the border between Talmour and Tova), his plans unravelled. His forces met an army out of Shandalle and Tova led by the young, brilliant general Artur Paendag Tanreall, King of Shandalle, known as 'Hawkwing' for the speed with which he could move his armies. Despite outnumbering Hawkwing by 2-1, Amalasan was defeated by a desperate tactical gambit and captured by Aes Sedai sisters accompanying Hawkwing. Hawkwing bore his captive north to Tar Valon, hotly pursued by several of Amalasan's best generals. Amalasan's supporters assaulted Tar Valon itself in an attempt to rescue him, breaching the Shining Walls and fighting almost to the White Tower itself. Hawkwing's troops engaged them in bloody street-to-street fighting and ultimately checked and reversed their advance. Amalasan was tried, found guilty and gentled, cut off from the One Power forever. He died, several years later, from the same traumatic malady that ultimately affected everyone who was cut off from the Power. In the aftermath of his victory, Artur Hawkwing returned home to Shandalle. Neither he nor his troops were thanked for their assistance by the fanatical Amyrlin Seat, Bonwhin Meraighdin, who resented the idea of the Aes Sedai needing help from any man. Bonwhin even punished those Aes Sedai who had captured Amalasan for allowing Hawkwing's army onto Tar Valon's territory. As the continent fell into chaos, with Amalasan's conquered nations descending into civil war and political strife after his death, Hawkwing's name had become famous and his name spoken as a potential successor to Amalasan. Citing this as 'proof' that Hawkwing was dangerous, Bonwhin manipulated several other nations into invading Shandalle. 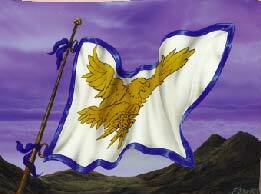 The banner of Artur Hawkwing. After returning home to Shandalle, Hawkwing planned to demobilise his armies and rebuild his nation from the tribulations it had suffered. Instead, within a few months of his victory at Tar Valon, he was forced back into the saddle. At Bonwhin's manipulation, the nations of Caembarin, Tova and Khodomar had declared war against Hawkwing. They cited him as a dangerous warmonger, noting that his name was now known across the continent and was particularly being spoken in those nations formerly held by Amalasan, which were now falling into chaos and civil war as different factions struggled for power. However, they did not pool their resources for the invasion, enabling Hawkwing to defeat each invading army in turn in a rapid war of movement. He launched counter-attacks and by early FY 944 had expanded Shandalle's influence into the neighbouring kingdoms. Other nations sent troops to subdue him, and again he prevailed. Between FY 943 and FY 963, the entire continent (bar only Tar Valon and the surrounding territory) fell under Hawkwing's control. Most of that was achieved through military action, with only the nation of Moreina joining him through diplomacy (thus ensuring that the Prophecies of the Dragon would remain fulfilled: the Stone of Tear was transferred to Hawkwing's control, but did not fall in battle). As Hawkwing's victories mounted, so the Aes Sedai's belligerent stance changed. Bonwhin's personal hatred of Hawkwing did not wane, but the Hall of the Tower worked hard to place Aes Sedai advisors within his camp. It is also likely that they considered the benefits of having the entire continent already unified under one ruler when the Dragon Reborn finally rose and the Last Battle would be fought. In FY 961, Hawkwing suffered a personal tragedy when his wife, Amaline, and three of his children were poisoned. Furious, Hawking blamed the last remaining free kingdom, Aldeshar. Hawkwing was normally honourable and magnanimous to his former enemies, sparing the lives of those who surrendered and finding places of authority and command for them in his empire (though never in those lands they had once ruled over). Aldeshar he treated harshly and brutally, executing King Joal Ramedar out of hand and scattering the nobility over much of the continent. With the conclusion of the war in FY 963, Artur Hawking was proclaimed the High King of the Westlands, an empire stretching for more than three thousand miles and incorporating a population of millions. But with the deaths of his family, his victory felt hollow and he was soon planning for more wars. In FY 964 Artur Hawkwing led a massive army into the Aiel Waste, planning to conquer the Aiel clans and bring them into his empire. For the first time, Hawkwing faced total defeat. His army was unprepared for the harshness of the terrain and environment, and also for the fact that the Aiel would not stand and offer open battle. Instead they used their noted mobility to harry his flanks and pick off his troops a few at a time. Unable to secure either a decisive victory or hit upon a winning strategy, Hawkwing was forced to withdraw back to the westlands. There, his 'black years' were brought to an end when he met a young woman named Tamika. History does not record her origin, but Tamika brought Hawkwing out of his time of anger and grief. They married and had several more children, and Hawkwing lost his appetite for war. Instead, he threw himself into administration and justice. He divided his empire into provinces in the hope of preventing feelings of nationalism reasserting and leading to rebellion. He forgave the nobility of Aldeshar for the crimes of their king and even made Ramedar's daughter, Endara Casalain, the governor of the Imperial Province of Andor, the largest and most populous of the provinces. Hawkwing instituted revolutionary systems of law, justice and peacekeeping. He commanded that under his reign a woman should be able to walk alone from the Aryth Ocean to the Spine of the World and not suffer molestation, and appears to have, at the very least, reduced instances of banditry. He sponsored the building of new cities and new roads, and trade and the arts flourished. Hawkwing was immensely popular with the common people, but not so much with the nobility, many of whom resented the fact that they were lords, ladies and governors when, without Hawkwing, they would have been kings and queens. Tiring of incessant plots against him, Hawkwing turned more and more to the Aes Sedai for advice. Noting their incorruptibility, Hawkwing even began to favour them as administrators and governors. By FY 973 more than one-third of the governors of the empire were Aes Sedai, giving the sisters more temporal power than they had possessed in two thousand years. Despite this, Bonwhin's rage and jealousy against Hawkwing continued to mount. In late FY 973, a man named Jalwin Moerad appeared at Hawkwing's court. A canny politician, Moerad won Hawkwing's trust by smoking out several conspiracies against his rule. In FY 974, apparently due to intelligence provided by Moerad, Hawkwing came to suspect Aes Sedai involvement in the various attempts to unseat him and dismissed all members of the sisterhood from positions of power within his empire. In FY 975 this transformed into outright hostility, and at Hawkwing's command a large army laid siege to the city. The reason for this is unclear, although it has been proposed that Moerad brought Hawkwing evidence implicating Bonwhin's involvement in the murder of his first wife and three children. It is notable that Hawkwing did not mount an assault on the city, though he could have done so easily at a very high cost in lives, and in fact seems to have not particularly had any animosity for any Aes Sedai other than Bonwhin herself. Ultimately the siege was not successful. Attempts to block the river failed due to Aes Sedai being able to remove obstructions with the Power, whilst sympathisers kept a constant stream of smuggled goods into the city to keep it fed. Although it soon became clear that Tar Valon could not be starved into surrender, Hawkwing refused to relent. The siege was maintained for the rest of his life. Outside of the siege, life continued in the empire much as before. But in late FY 986 word came of Shadowspawn massing in huge numbers in the Blight. A vast army of Trollocs, Myrddraal and other creatures invaded the northern provinces, sweeping south at speed. Hawkwing, still hale and capable of moving with his customary speed, met them in battle on the field of Talidar early in FY 987. 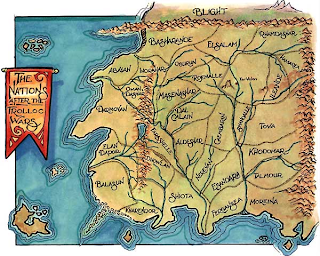 A second set of Trolloc Wars was prevented when Hawkwing, acting without Aes Sedai assistance, smashed the invading horde with such force that Shadowspawn activity along the Blightborder was reduced for the next several centuries. This victory re-energised Hawkwing. He began mobilising fresh armies, ordering the assembly of vast fleets along both the west and southern coasts. He also planned to build a new capital at the exact mid-way point of his empire, on the plain of Caralain Grass, but ultimately did not live to see this accomplished (a great statue to him was raised there, but it was later destroyed by nobles jealous of Hawkwing's accomplishments). In FY 992 Artur Hawkwing launched the first of his two great fleets. Two thousand ships carrying more than 300,000 soldiers and settlers sailed west into the Aryth Ocean, seeking fresh lands beyond the sea. They were commanded by Hawkwing's eldest surviving son, Luthair Paendrag Mondair. It seems highly improbable that Hawkwing would send so many people into the unknown unprepared, but history does not record the existence of an earlier scouting expedition that may have found evidence of another continent in the far west. What is known is that Hawkwing founded a society known as the Watchers Over the Waves at the port of Falme to relay any messages that came back from the fleet. It appears that some garbled communications did make it back, making reference to the 'Armies of the Night', but nothing more than that. A year later, the second fleet and army (reputedly of the same size as the first) was completed. This force sailed east along the coast of the Sea of Storms, south of the Aiel Waste, and landed on the south-western coast of the subcontinent of Shara. Under the command of one of Hawkwing's daughters, this force secured several cities along the coast and struck inland. However, it appears that Hawkwing underestimated the military and naval prowess of the Sharans. According to the Sea Folk (who did not join in either operation), his fleet was later sighted burning in the harbours of the cities that had been captured. It is presumed that his army was slaughtered or taken captive, never to return home. The lack of news from either expedition seemed to put Hawkwing into a decline. He fell into a fever and suffered hallucinations of people long dead and battles long ago fought. He maintained enough sanity to order his general, Souran Maravaile, to continue the siege of Tar Valon and refused an offer of Aes Sedai Healing that could have saved him. Even the news that Bonwhin Meraighdin had been stripped of the Amyrlin Seat and stilled for her attempts to manipulate him did not make much of an impression on him. Eventually, Artur Paendrag Tanreall died at the age of eighty-two in FY 994. When Hawkwing died, he left behind no heirs. Luthair was lost beyond the Aryth Ocean, another daughter in Shara. His only surviving child, Laiwynde, had died in murky substances and his grandson, Tyrn sur Paendrag Mashera, had apparently died with her (a man claiming to be Tyrn was later made First Lord of the city-state of Mayene, but this claim was ignored by everyone outside of Mayene). Inevitably, the death of Hawkwing would lead to a fracturing of his empire, but at the time no-one had any idea of how devastating this would be. The banner of the Children of the Light, an independent military order that rose to prominence during the latter part of the War of the Hundred Years. Upon Hawkwing's death, the Aes Sedai acted quickly. The newly-raised Amrylin Seat, Deane Aryman, mediated with Souran Maravaile, commanding the siege of the city. She urged him to abandon the siege as it no longer had any point to it, but he refused to disobey the last command of his king. Deane enlisted the aid of Ishara Casalain, the daughter of the governor of Andor and also Souran's lover. With the seeds of civil war being laid, they convinced him that his large army could be used for a positive purpose. He agreed. Ishara Caslain convinced her mother to resign as governor and then proclaimed herself Queen of the Kingdom of Andor, with its capital at the city of Caemlyn. Maravaile's army secured the city and the surrounding countryside and Tar Valon made a formal alliance with the new nation. This act sent shockwaves across the continent. Hawkwing's empire shattered into a thousand pieces, dozens of nobles proclaiming themselves kings and queens. Several of Hawkwing's senior governors and generals made attempts to claim the High Kingship of the entire continent, but this proved futile. Instead, a series of overlapping wars began which lasted no less than one hundred and twenty-three years. In FY 1021, a peaceful man named Lothair Mantelar wrote a book called The Way of the Light, in which he preached strict obedience to the will of the Creator. The book was critical of the Aes Sedai for daring to wield the One Power, which was the responsibility of the Creator alone. An organisation dedicated to furthering Lothair's ideals was formed, the Children of the Light. Originally a pacifistic organisation, the Children soon took to arming themselves to surviving in the chaos of the war and by FY 1111 had become a fully military organisation. By FY 1117 the last vestiges of Hawkwing's empire had been swept away. Twenty-four new nations arose in its place. The continent had been devastated by the War of the Hundred Years and population levels dropped dramatically, never to recover. Ten of the new nations (including Almoth, Hardan and Maredo) failed within a few centuries, leaving vast stretches of mostly-uninhabited wilderness where once great cities and nations existed. A new calendar, that of the New Era (NE) was adopted circa FY 1135 due to confusions over dates arising from the chaos of the civil war. Next time: events across the Aryth Ocean, the fall of Malkier and the Whitecloak and Aiel wars. Some interesting points: Skagos is the same size as Ireland, so not the tiny little island readers may be expecting from its size on the map. 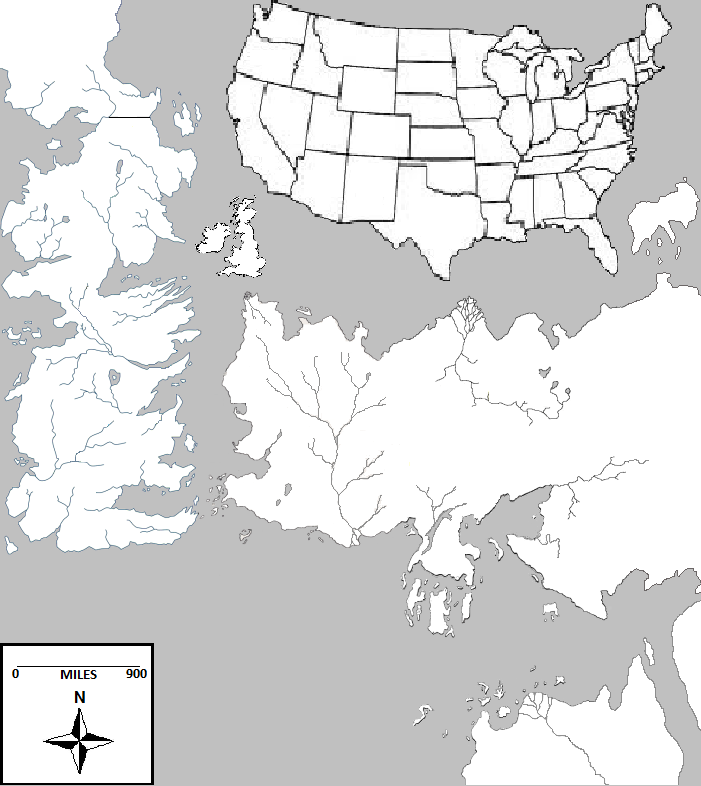 And Dany's journey in A Game of Thrones alone (not to mention the north-west length of Westeros) spans a greater distance than the east-west width of the United States. 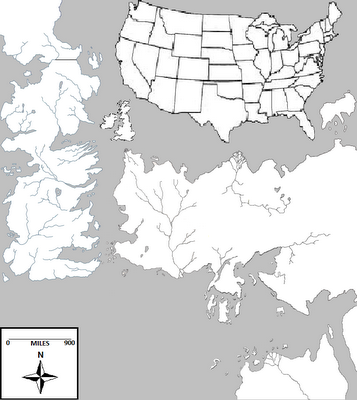 Also, the North is so huge it can swallow up the entire British Isles several times with room left over. And Catelyn's travels in A Clash of Kings were the equivalent of crossing Texas and back again with surprisingly little trouble.